Roppongi is for sure the #1 foreign friendly city in Tokyo. Since Roppongi and its neighbor city like Azabu and Akasaka are home to many foreign embassies, bars, restaurants and night clubs are very friendly to English speakers. People might say Roppongi is all about Nightlife but there are amazing museums, luxury shopping and more! The 360 degree view from Roppongi Hills Observatory is A LOT better than Shinjuku Metropolitan Government Building that I included in 10 Things to Do in Shinjuku. There is an entrance fee but I think it's worth it. Tsurutontan is definitely our favorite udon restaurant for their menu variation, the consistency in quality, atomosphere and the best customer service. It's not a cheapest place but not that expensive for its quality. When you shop in Roppongi, make sure to bring your bank. Roppongi Hills and Tokyo Midtown are high-end, luxury shopping center and you won't find many of those shops you see in Shibuya and Shinjuku. If you are into high brand, this is where you will love (or Ginza). Also there is a discounted shop, Don Quijote for you to pick up some souvenirs at a reasonable price. Roppong is not just about nightlife. Museum hopping could be a way to spend your day. Mori Museum tends to cover trendy and fun topics, and The National Art Center have traditional stuff. You also might like Snoopy Museum and other places. Izumotaisha, also known as Izumo Shrine is a brand of a well-known shrine in Hiroshima. It's a tiny shrine but isn't it nice to cleanse your body and soul before hitting Roppongi Party scene? Hinoki Park is located just behind Tokyo Midtown. This city oasis is just so relaxing. BrewDog - If you love beer, go there. Rigoletto - A restaurant bar with great food. Cafe 8 is a Japanese-Chinese restaurant that I love for the Beijing duck and fun interior. Clubs in Roppongi are mostly Top40 pick up clubs. If you are looking for EDM, check out Clubs in Shibuya. 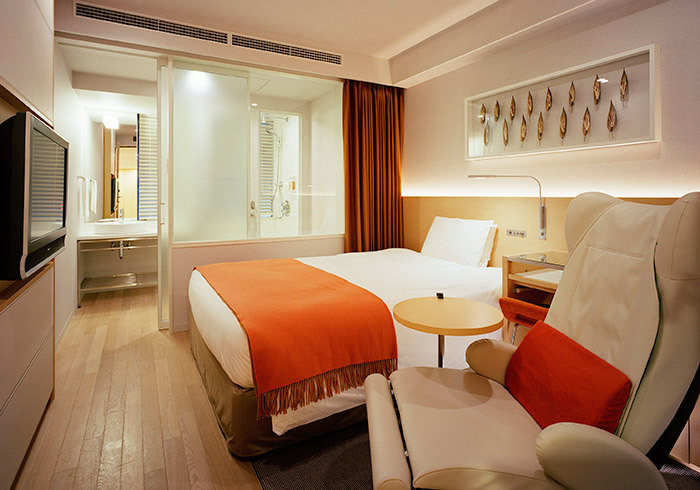 I would categorize Candeo Hotels in Luxury Business Hotel. It's newly opened in October, 2017. Everything is new and the service is great, but the highlight of Candeo Hotels is the sky spa with the view of Tokyo Tower! Isn't that great? Candeo Hotels is located just 2 minutes away from Roppongi Station, and very close to clubbing area. Remm hotel does the great job to create the relaxing environment to make you sleepy! Every room has a massage chair, clean modern style room, perfect bed invented with Japan Bed Production company, and great amenities with nice scent. The hotel is located just one minutes walk from Roppongi Station. First Cabin is an airplane themed capsule hotel. If you want to do something different and traveling by yourself, this may be your choice. You get this futuristic cell to spend a night or just rest for a few hours. (They charge by hours during the day.) It is located in Nishiazabu so it is a bit of a walk to Roppongi station area.